On January 15, 2018, l flew from Springfield to Accra, Ghana by way of Amsterdam. The flight from Atlanta to Amsterdam was one of the shortest flights on that route due to (in the words of the pilot) an “angry wind.” I arrived in Ghana the following evening. The next day, I took a short flight to the city of Kumasi where I was met by three of the ministers. I was welcomed in Ghana with the typical arguing between public transport drivers who fight to get customers. The arguing would get loud and our luggage would be involved in a tug-of-war between rival van companies. We traveled to Asankare where the late Bro. Andrews pastored. Bro. Albert is currently pastoring this small congregation. We had service in the sweltering heat of the evening in the chapel located among the tropical trees. The following day we visited Bro. Andrew’s sick wife in another town and proceeded back to the city of Kumasi. 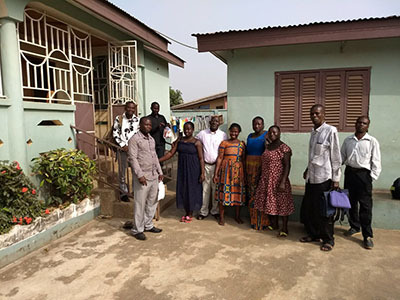 Kumasi has a fledging congregation that was newly planted two years ago. I was once again warmly welcomed, and we had a house service. There were a couple of visiting ministers from other churches who were very interested in the truth. I continually stand in amazement at the power of the simple gospel that we so often take for granted. Many denominational ministers hear and revel in the truth and yet refuse to follow it as they believe their congregations will not walk this narrow way. We left about $60 for a deposit at a local school so that the congregation could begin worshipping in a classroom on Sundays. We traveled to the mission at Akumadan, arriving after dark. 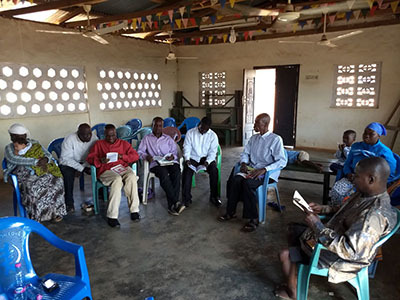 During the succeeding days in Akumadan, the ministers would meet during the morning and afternoon for Bible study and gospel discussions. In the evenings, we would travel to one of the four local congregations for service. The time was well spent with the ministers studying various subjects and answering questions. There are some subjects, such as women in the ministry and the head covering, that can be difficult to explain. These were just a couple of the many subjects that were asked about. It is noteworthy that the scripture addresses these topics in a cultural context. Hence, our explanations and teachings today must also take into account the practices and traditions of a given culture, just as they were addressed by the apostle Paul. One particular night after service, we stood on the tarmac trying to get transport back to Akumadan. Vehicles were full and we waited for some time. Eventually, a vehicle pulled up that was full of people. It was driven by the son of one of the ministers. They told us to get in and we did as instructed. Soon, the van was full of yelling and shouting. I had no idea what was transpiring as it was in the language of Twi. Soon, the vehicle pulled over and a policeman got out of the back of the van. He and the driver got out in the dark and were on their phones. Come to find out, the van was overloaded and a policeman who was in the back of the van got angry. He told them to pull over at the next police barricade, which our driver ignored. The policeman had our driver call the owner of the vehicle. Thank the Lord, the owner of the van was another policeman of a higher rank, so we were back on road again. 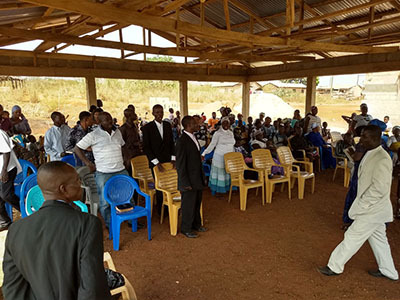 On Sunday, the four local congregations met together under a newly constructed tabernacle in one of the nearby villages. The Spirit of the Lord blessed in the service with inspiration and anointing. We were grateful for the souls that opened their hearts to the Lord. That evening, as I sat in my room at the mission house, I heard yells and shouts. It grew to a crescendo and I realized it was more the sound of a mob. I went outside, and to the side of the mission house, there was a large group of people. Two young men had hold of another young man and were cutting him with a razor blade. They accused him of stealing, but the truth came out that they were stealing from him. The crowd intervened and separated them, even while they still tried to fight. The young man had razor cuts on his wrists, neck, and forehead. With blood running down his face, he came on the mission house steps where some from the congregation talked to him. Sis. Patricia, daughter of one of the ministers and wife of Bro. Dima from Germany, took him to their home and fed him. I went to visit and talked with the young man. He acknowledged the sin in his life and prayed a prayer of repentance unto salvation. I do not know what his end will be but let us pray for God to continue to call after these hurting souls. I was well taken care of in Akumadan. Sis. Patricia cooked meals for me that looked like they came from a restaurant. I appreciated so much their warmth and hospitality. The weather was over 100 degrees but God helped the nights to not be as difficult as some I remember from the past. The ministers in Akumadan come from small, poor congregations which are not able to support them in their gospel efforts. 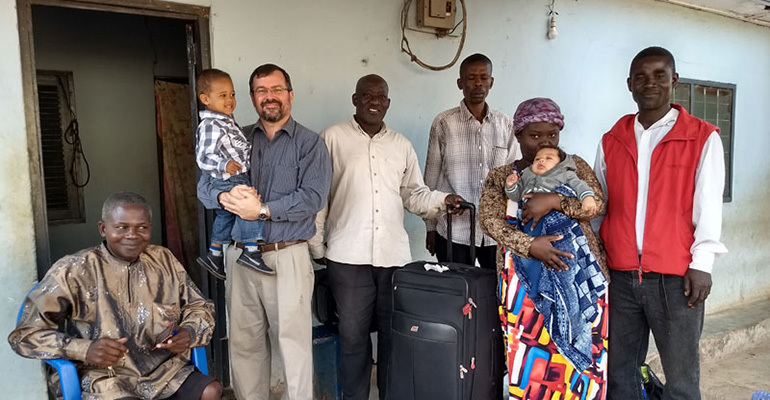 The ministers desire to take the gospel to different villages and towns in Ghana. 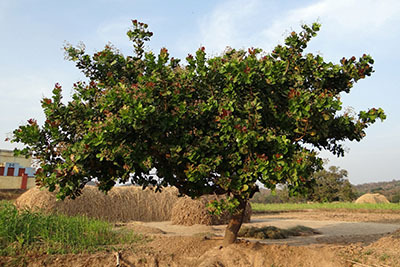 An idea that is gaining traction, as God provides the funds for the long-term support of the work, is to purchase a few acres ($550/acre) and plant cashew trees which take 3-5 years to produce. The yield would fund the Ghana camp meeting and provide support for the local congregations and ministers. I am excited, with some practical reservations, to see what God can do in this venture. Following the week in Ghana, I flew to Kenya and arrived early morning on January 23. Read more about the Kenya trip.